With the exception of sledding and other snow day activities, there’s not a whole lot for kids to do outside during cold winter days. But keeping them occupied inside doesn’t have to mean turning on the TV. If you’re looking for inexpensive entertainment that has benefits far beyond just keeping kids busy, look no further than the humble board game. According to Elizabeth Brunscheen-Cartagena, family life and resource management agent with Kansas State Research and Extension, board games can help family members connect and have fun together, all while helping kids build essential learning skills as they navigate the social component of game playing. Unlike video games, board games promote face-to-face interaction -- "a vital component in human relationships that is fading away," says Brunscheen-Cartagena in a statement to Newswise. Face-to-face interaction is a key component to connecting, learning how to read body language, and developing what she calls “social capital." Non-face-to-face interactions -- as experienced in online video games, for example -- often mean the attention is on the screen rather than the players. This can create a sense of anonymity, leading players to present themselves differently than they might ordinarily, says Brunscheen-Cartagena. Board games, on the other hand, allow families to connect with each other and foster traits of strong families like positive communication, successful management of stress, and commitment to each other. Communicating verbally, sharing, waiting, taking turns, and enjoying interaction with others are just a few of the important social skills that can be learned through games, according to Scholastic. Since kids can’t learn if they struggle with following directions, getting along with their peers, or controlling their emotions, mastering these important social skills can help them become better learners. “Every face-to-face game provides a ‘social experiment’ where players learn self-regulation and social skills to play successfully with others,” says Brunscheen-Cartagena, adding that a lot goes on under the surface, even when playing easy games. Children can regulate their emotions and behavior, learn to calm down when upset without hurting others, and learn how to win -- or lose -- with manners and humility, she says. 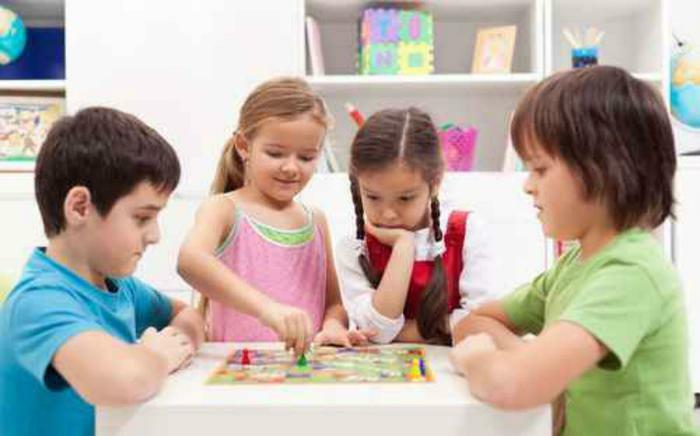 Logical thinking -- or the ability to reflect on the task demand and independently use the appropriate reading, writing, math, or learning strategy -- is another skill kids develop through playing board games, says Brunscheen-Cartagena. Some games introduce geometry concepts with shapes and patterns, how to classify items (pattern recognition and matching), and support learning about measurement, including distances and amounts. Problem solving and critical thinking can be strengthened with practice and learning, she said, adding that kids might make even more improvement if we encourage them to explain their tactics or the tactics they see others use.